Col de Sarenne is the beautiful and remote Col a few kilometres beyond Alpe d’Huez. 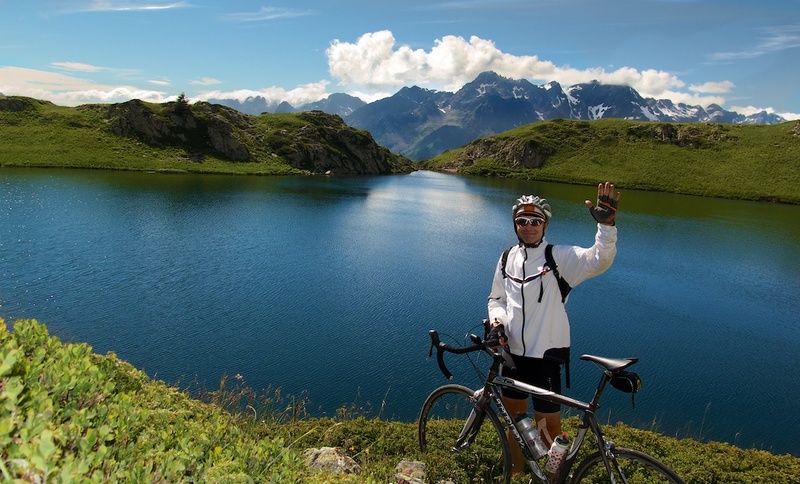 It’s a great climb / loop with Alpe d’Huez – see here. My goal for this ride was to reach Col de Sarenne another way, via the little known Col de Cluy, above Auris ski station. I started at the foot of Alpe d’Huez and climbed the first five of the famous twenty-one hairpins. At the sixth (signed as hairpin #16), I turned off on a great little cliff road signed to Auris. This is a longer, far quieter, and far more scenic way to Auris than starting along the main road down below. Note, in the link above, I also used this cliff road as a great long cut on the more traditional route to Col de Sarenne. Highly recommended. After a few kilometres, this road turns up to Auris ski station. I got a little lost here searching for Col de Marone, but finally ended up following the correct – unfortunately gravel – road to Marone. From here, with a mountain bike, it is certainly possible to continue on a different route to Col de Cluy. But I turned around with my road bike. Someone had told me that the route to Col de Cluy was paved. They were misinformed. In fact, it is a good quality gravel path. But I had come a long way, so I decided to risk it on skinny tires. It’s a very scenic little road. You can see more of it below me in photo just to the right. Over the top is also gravel. Bah. I proceeded very gingerly down and soon saw the paved road between Col de Sarenne and Alpe d’Huez. I briefly visited Sarenne via the paved road. It is a great descent over the top of Sarenne. But I had other plans. Alpe d’Huez was enjoying another very busy day of cycling tourists. As usual though, the majority had mistakenly thought the official finish line is the big line painted across the street by the Trek store as the route enters town. But the actual finish is a kilometre further and decently signed. I passed it – there was barely a cyclist there – and I headed higher. 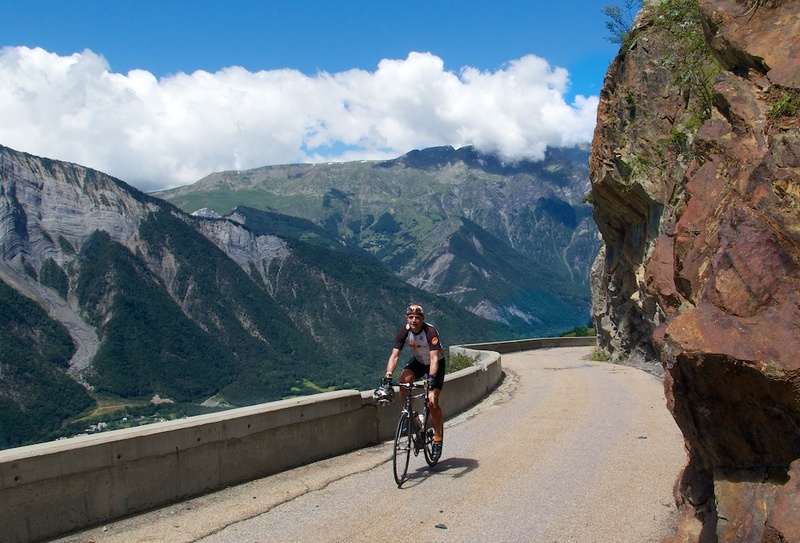 One can cycle 4 kilometres on paved roads above Alpe d’Huez – and it is worth doing. It’s a little more than 2 kilomteres up to Col du Poutran. Then a couple more to the end of the road and some beautiful little lakes. I am always slightly amazed that so many cyclo-tourists fly all the way to France with Alpe d’Huez as their primary goal yet, fail to visit the true finish line, and worse, fail to explore higher. I’ve cycled the Cluy in the other direction, in winter on snow. Probably a better surface than gravel. Hi Will, can the gravel surface be traversed by a road bike on skinny tyres? Going to Le Bourg in a couple of weeks and im finalising some routes! When I did Cluy it was with a road bike and the unpaved surface was not too bad (and not tooooo long). BUT, it’s impossible to predict how an unpaved road has aged over the last few years. Might be rougher just after winter. Sorry, tough to give any guarantees. Enjoy your trip. Can I just say what a great website this is. I’ve just done the Col De Cluy and Sarenne. Without your information it would not have been possible. Many Thanks. One thing that has become apparent after a week in this area if that all the ‘piste maps’ cater for downhill mountain bikers. Have you considered producing your own map of gravel roads? I’d think there would be some appetite for it. 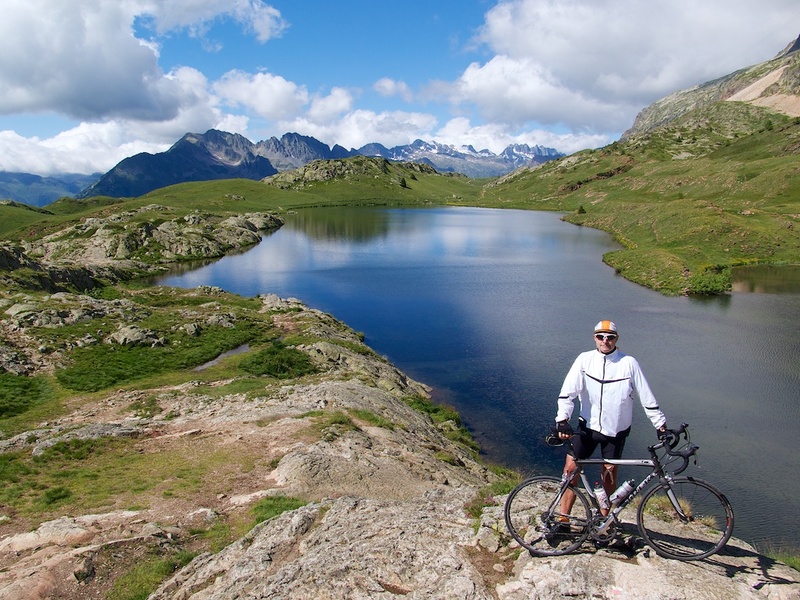 I saw your post a few years ago and rode up to Lac Besson – a great recommendation. 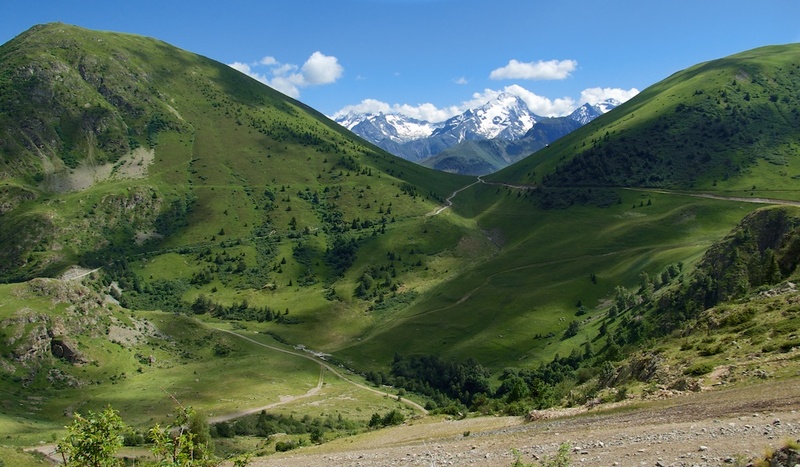 Have you ridden the stretch on from there, over the top to Vaujany? 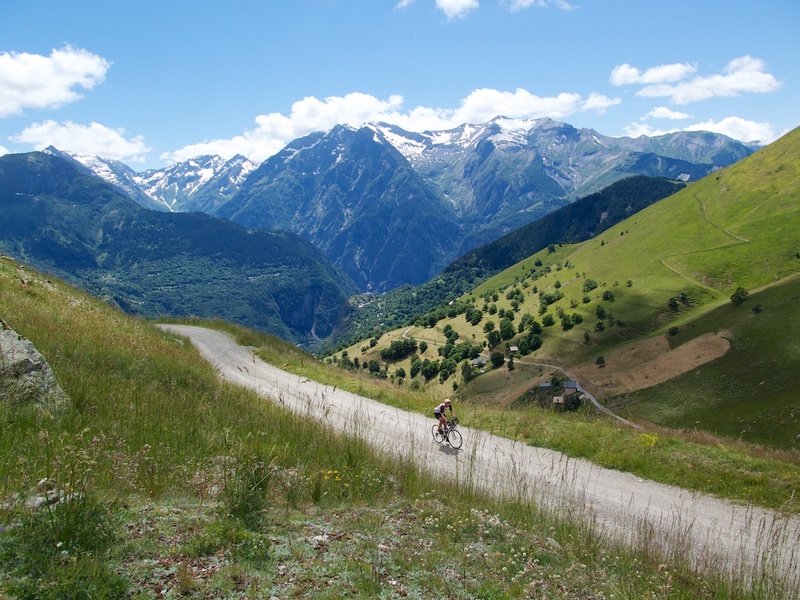 I’m planning routes for this summer and am wondering if Alpe d’Huez to the Col du Sabot is ok on an cyclocross bike. It’s on my list. I think it’s quite rough, but not certain. Probably depends how fussy you are. Should be great though. It’s the 800m apparently at 25% just before you reach the road that worries me most, in either direction!